On Christmas evening I hopped my way across the US back to Seattle to see Hope. Thanks to Hotwire I didn’t break the bank and got a decent package deal; the only downside was discovering at 10pm PST that my hotel was a flippin’ 30 miles away. Oh, that of course would be 30 miles further away from where I needed to drive the next morning. Oh yes, going to see Hope after traveling 3,000 miles was going to require an additional 55 miles. So after crashing in my hotel, I got up, hit the free breakfast, googled the nearest Starbucks, picked up a venti-iced and hit the road. Got a call from Foster Mom that my girl was is a pissy mood that morning. Super awesome! I did manage to guess correctly that Hope was a pill with her fosters because I was in route. I know that she cares for them greatly, but it was an interesting discovery that somehow my arrival was important enough to give me some primacy in Hope’s rankings. I don’t like the fact that she treated them poorly, but I would be lying if I said that my ability to figure out her behavior and its trigger as my own reassurance that I *get* this kid. Hugs greeted me and along with a urgent need for me to open my Christmas gift! Yeah, Hope also *gets* me. I wondered to myself after opening her gift, “Did she really see me drink much wine during our visit? I was dry until she went to bed, and I rushed to dispose of the bottles!! !” Then I shrugged, knowing I’d done well on my visit, giggled and gave Hope a hug for her thoughtful observation of my imbibing habits. 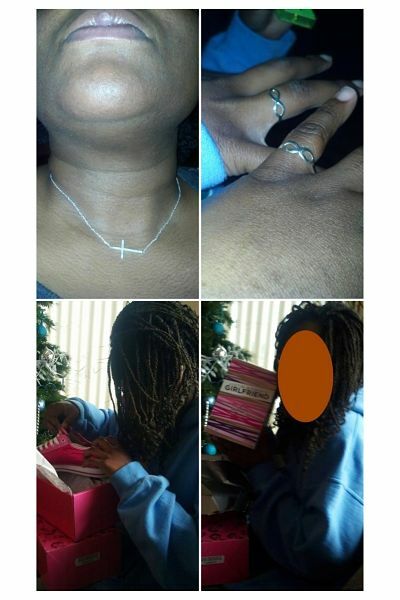 Hope was delighted with her new sparkly sneakers (though they were “off-brand” #girlbye with your no job having self! LOL), Bieber perfume and gift cards, but mostly with the perfume. Grammy gave us both diamond cross necklaces. She seemed to forget about the absence of electronics for the moment. 1) Bless her heart, Grammy really needn’t have spent money on real diamonds; Hope hasn’t a gem discerning bone in her body. At some point I’ll have to take her with me to a real jeweler for a crash course on gem stones. For the record, silver tone bracelets with giant rhinestones that spell out BOSS from Wet Seal are in no way real. For a child that is going through that phase where she swears that wearing “fake stuff” will make her limbs fall off, she’s should be a limbless, jolly, green girl by the time she gets back to the east coast. Again, #girlbye! 2) Light skinned brothas are, in fact, back in style. Sigh…I think every brown girl goes through this phase of sweating the fair skinned fellas with the curly hair and if you’re really lucky, dimples. It’s such a cliché of epic proportions. It’s ok to be attracted to whomever you’re attracted to, but her colorism issues are real right now, including her belief that she’s not really worthy of the fair skinned fellas because she’s dark. No, just no. Sigh. I have so much work to do with her. Aside from the fair toned dudes that we peeped for hours on end, I also realized I’m going to have to watch my girl like a hawk and forcibly put her in every activity I can think of and afford. Her boy craze is so serious; I know she is particularly vulnerable to the lackluster charms of any dude who might look at her with modest interest. She’s desperate for the attention with a side of twisted validation of her beauty and worthiness. It’s so sad. I hope to help build her self-esteem while cloistering her a bit until she’s healthy enough for a decent teenaged crush. Pray for me! As an aside, can we get just one Black boy band group? I mean, I dig One Direction and whatever that other little group is, but dang, can ABM get her sweat on to some brown bubble gum pop? I mean I grew up with New Edition and Boyz II Men! Can I get some diversity in these new age boy bands, please?? 3) Hurt can easily equal painful anger. Hope had a flash of anger while we were at an arcade that resulted in her banging a pinball machine so hard she bruised her hand. Game winning is another way that Hope pursues some sense of self-worth; losing can easily result in a meltdown. I discovered this during our Thanksgiving visit, but I saw it all over again during this short visit. She mentioned that she has issues with anger, but I know that it’s really about hurt under the surface. This is definitely something we will have to work on in therapy. Life’s game has lots of losses; she’s going to have to learn to cope with that without getting so angry. I’m cognizant of the fact that one day she’s really going to blow and rage with me; I’ve got to be ready to deal with that in a constructive way. It’s going to happen. 4) I have achieved hottie status in my head. Ok, not really, well maybe, kinda. Hope ran into a few of her friends at the mall—including the one who actually smokes weed, SMH (another post for another day). I politely stood to the side while she chatted, giggled, pointed out boys and acted crazy when she thought a boy looked remotely in her direction. She never introduced me to her friends. Yeah, I felt some kind of way about that, but oh well. After the little kitty-klatch ended and we walked away, she told me she told me that she told her friends that I was her mom (that still makes me smile) and they said, cool, I was pretty. Hot damn, the tweens think I’m pretty. It was an unexpected ego snack. I’ll take it. Don’t judge me. 5) Hope’s ready to move. She’s still a bit anxious about what life will be like here, but her general anger and angst about the imminent move has subsided. It makes things easier to know she’s coming to terms with this major change. My life is about to change dramatically, but I know she’s giving up a lot moving so far from everything she’s ever known with worries that I’ll reject her. I got clued in that she was increasingly resigned to the move and coming to terms with it when she did not flip out when I denied her purchase of a CD and a game with adult ratings. Maybe this seems like a stretch, but I laid out some rules/expectations during her visit here. Hope’s been exposed to so much that it is like trying to put Pandora back in the box, but I’m committed to reigning her exposure to crap in dramatically. It annoys her but she’s come to respect it. She understands that there are things she has to earn—like the tablet, the cell phone and whatever other little thing she manages to come up with each week. And she will still test the limits but there isn’t a meltdown when the limits hold. Hope respects my authority, my position, my final word. This is as much a power choice as calling me mom was. She’s ready to move, even if she does hope she gets to go on the field trip next week and the band concert later in the month. So, in all it was a lovely visit, even if it cost me about a $100 for every hour I spent with her (ouch when you put it like that). I’m feeling good about us. I love her so much. I read often that love takes a long time to grow with adoptive parents. I am no fool; I know there are times when I really will not like her very much. But I do love Hope, of that I’m sure. I am also proud of myself for taking time to sort through what I’m learning about myself and Hope as we transition. It helps me know that it’s not going to always be an easy path, but if I pay attention and take a breath I can see the street signs and take heed. In other news, I submitted chapter 4 of 6 to my dissertation director tonight for comment. On to the next one! This entry was posted on Monday, December 30th, 2013 at 11:56 pm	and tagged with adoption, Adoption Transitions, Boxing Day, Christmas, Foster families, New Adoptive Parents, New Moms, Visitation and posted in The Transition. You can follow any responses to this entry through the RSS 2.0 feed. « OMG, She Looks Like You! 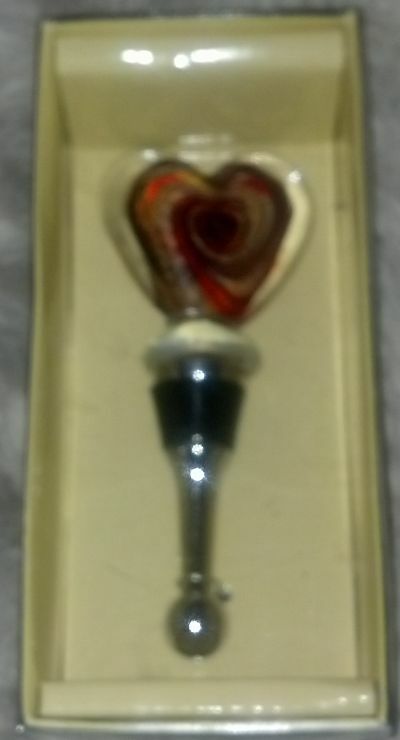 Ha @ Hope knowing to buy you a wine stopper. Did you say bottles? LOL. I love your commitment to “reigning in her exposure to crap.” I learned when I was thirteen that I needed and wanted boundaries and got into trouble when there weren’t any. I’m glad your trip was lovely. Yes, the more boundaries I put up, not strict but important stuff, the more stabilized her behavior has become, even across country. Sounds like a wonderful trip and great that she is acknowledging some of your boundaries. Yep the boy thing is a bear. I deal with my 13 yo and that all the time. You have my support on that one for sure. Good job on the dissertation!!! AdoptiveNYMomma, Please send tips/ideas for what seems to be working in navigating the boy terrain. I went through a boy crazy phase, but this seems to be a whole other level of crazy! My strategy is to keep her busy, busy, busy!